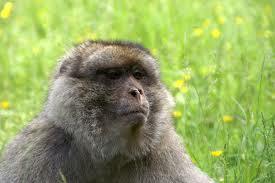 Story: The Monkey And The Apples - Something New Everyday! He admired his new possessions proudly as he wandered the jungle. They glistened red in the sun, and seemed perfect to him. He became so attached to them, that he didn't even notice his hunger at first. less happy monkey continued to walk along the forest trails. The apples became heavier, and the poor little monkey thought about leaving them behind. He was tired, hungry, and he couldn't climb trees or collect fruit with his hands full. What if he just let go? Letting go of such valuable things seemed crazy, but what else could he do? He was so tired. Seeing the next fruit tree, and smelling it's fruit was enough. He dropped the wooden apples and reached up for his meal. He was happy again. Like that little monkey, we sometimes carry things that seem too valuable to let go. A man carries an image of himself as "productive" - carries it like a shiny wooden apple. But in reality, his busyness leaves him tired, and hungry for a better life. Still, letting go seems crazy. Even his worries are sacred apples - they prove he's "doing everything he can." He holds onto them compulsively.